I love my Hulda Clark Zapper. When I use it, I can imagine all the little germs getting electrocuted until I am strong and well again. For me it works so well, I got into the zapper business. I started out making zappers by hand for friends and they found so much benefit in their handmade zappers they all told me I should go into business selling Hulda Clark Zappers. After a few years of being told just that, in 2001 I did start a business, and Natural Health Supply was born. I can honestly say I have helped thousands of people follow the Hulda Clark lifestyle, and have gained so much hands on experience in self health that I am now an internationally renowned expert in all things Hulda. I love having knowledge that keeps my family healthy, and I am lucky to make a living helping people. It’s a nice way to make a living, because people are wonderful, and need all the help they can get. The world is full of strange wicked folk who seem to prosper by harming others. It’s sad. I think one can get so much more out of bringing good into the world with the same amount of effort. 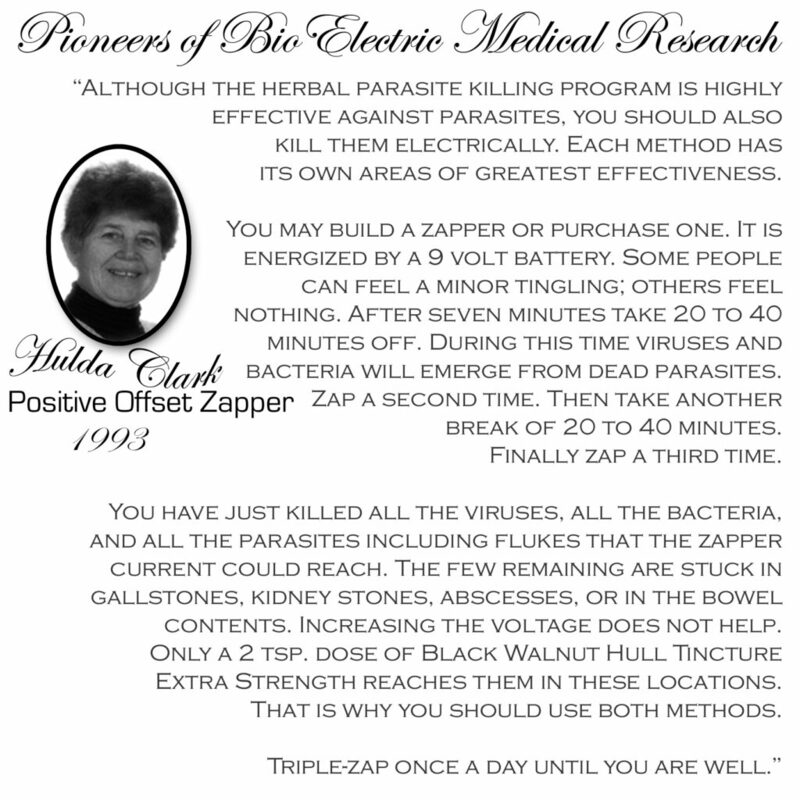 Hulda Clark’s Parasite Zapper works, and if you talk with anyone who has one, they will tell you the same. The only people who seem to not believe in Dr. Clark’s work are those who never read her books or tried her methods. It’s hard to give credibility to those without experience, but for some reason they are often the loudest voices out there. Not sure how having no experience makes anyone an authority.